Jive Knowledge Base : E-16D: Why are my combination temperature/humidity sensors reading different humidity values? E-16D: Why are my combination temperature/humidity sensors reading different humidity values? If you have two or more sensors reading different humidity values, the most likely cause is that the temperature values are different for each sensor. When air gets warmer, more water can be “held” in the air, and when air get colder, less water can be “held.” This relationship is known as relative humidity. Relative humidity is the amount of water vapor in the air at a specific temperature to the maximum amount that the air could hold at that temperature, and is expressed as a percentage. 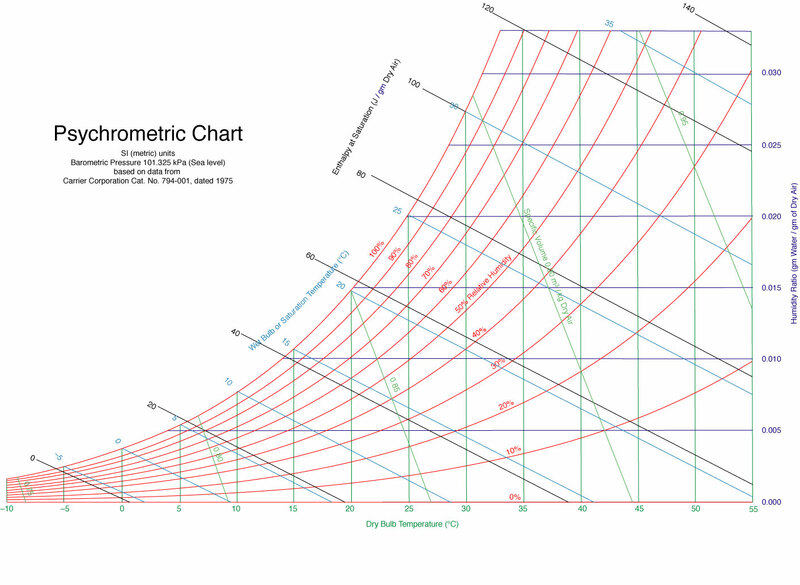 Below is a Psychometric Chart showing the relationship between temperature and humidity. Notice how the humidity value changes when the temperature value changes.